Snacking is often regarded as unhealthy, but this is mainly due to the fact that most popular snacks contain some pretty nasty ingredients. Even if a healthy Paleo diet helps keep hunger at bay and even if eating every few hours is not a particularly good habit to have, it doesn’t mean that snacking is out of the question, especially when the snack is homemade from natural and fresh ingredients. They are especially great for very active people, who often need more calories to fuel their activity level or for people on the go who require food that’s easy to bring with them. When it comes to paleo snacks, there is very little available at grocery stores that come in the form of a prepared snack and meet the Paleo criteria. I therefore decided to come up with my own version of veggies and dip. 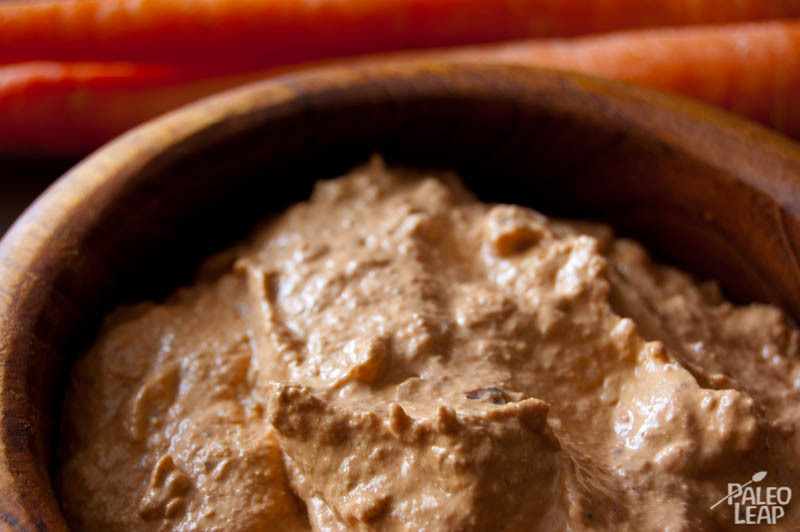 One of my favorite snack recipes is one that I have already shared with you, Baba Ganoush. However, as much as I love it, I needed something else to ensure I would not get tired of it. This recipe is a dip that can be prepared in no time and is suitable for any occasion. I just recently whipped it up for a dinner party I was attending and it was a great hit. It is certainly one of those dishes that people assume requires a lot more than it actually does. This recipe calls for 2 cups of nuts like pecans, almonds, macadamia nuts or walnuts, but just about any kind of nut will do here. Just keep in mind that, while nuts and seeds are generally healthy, they should still be eaten in moderate amounts, with exceptions such as macadamia nuts, which are generally healthy even in higher amounts. Finally, the recipe calls for a jar of roasted red bell peppers. Be sure to look at the ingredients and you should normally be able to find one that comes packed with olive oil only, not any other vegetable seed oil. 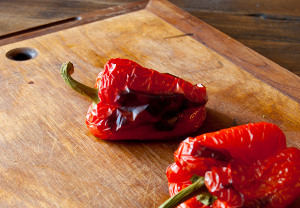 An alternative to that, for those who don’t mind spending the extra time, is to roast your own bell peppers. They can be roasted in the oven, on the grill or near the flame of a gas stove. To roast them in the oven, place them on a baking sheet in a 400 F oven for about 35 minutes. Once properly roasted, they can be placed in a bowl of cold water to help the skin loosen from them. When cool enough to handle, remove the skin with your hands. For this recipe, 3 red bell peppers should be enough. Place the nuts in a food processor and process until they are crumbs. Add the mayonnaise, cumin, salt and pepper and continue mixing until everything is evenly combined. Add the remaining ingredients to the food processor and process until it takes on the form and consistency of a dip. Taste and add additional salt, pepper and/or lemon juice if desired. Serve it up with some fresh veggies and you have yourself a healthy end enjoyable snack!